Heat a small skillet on medium heat, add the walnuts and toast until golden, about 2-3 minutes, shaking the pan gently during the toasting so the walnuts don’t burn. Remove the walnuts from pan to plate to cool. Melt butter in same skillet and add apple, pears, brown sugar and cinnamon. Cook until the fruit is soft, about 4-5 minutes. Add the maple syrup and cook until the syrup thickens a bit, approximately 2 minutes. Transfer to plate and cool. Divide the yogurt into four parfait dishes. 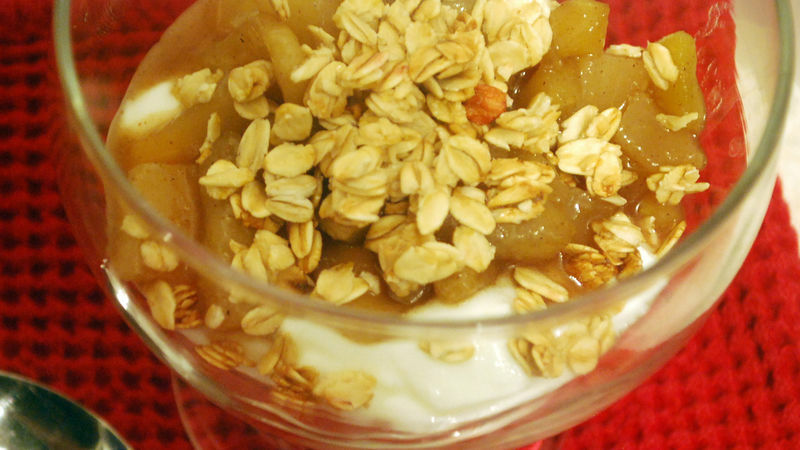 Top with apple-pear mixture and the granola. Sprinkle with walnuts and drizzle with just a bit of maple syrup. Serve.